When some people think about retirement they think about downsizing and simplifying their lives, but not Rosemary and Vahan Martirosian of Weston. After selling the company they owned, they immersed themselves in finishing their 5,000-square-foot basement and asked for my help in designing an entertainment space that would accommodate activities for their five children and their spouses, and their grandchildren. 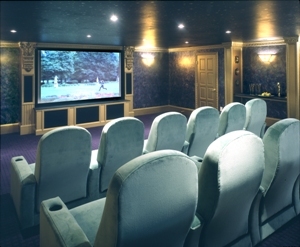 I partnered on the project with Huntington TV of Newton to design a media room in a portion of the basement. Larry Shulman, one of the owners, focused on the technology; I designed the stage, seating and interior décor. The requirements were to provide seating for the Martirosian’s large family and make the room fun. Rosemary wanted an art deco feel to the space. It was also important to use her favorite color of celadon green. The space available for the home theater had some shortcomings. The area had to be confined within a space defined by several lally columns. It would have been possible to move the support columns, but that would have added another dimension to an already large project. There were also two windows that Rosemary wanted to keep, to provide natural light and fresh air when the theater was not in use. I worked out a floor plan that would accommodate 18 theater chairs, with an exit row on either side of the seating. The Martirosians had hoped for another row of seats, but there just wasn’t enough room. We decided that the younger children might enjoy lying on the floor with big pillows to watch the movie if more than 18 seats were required. The first row of theater chairs sat on the floor, while each of the two rows behind was built up in a staggered fashion to provide ease of viewing. For the chairs we used seating by Irwin, a company that supplies most movie theater and auditorium seats around the world. The decorative element of the room required that the speakers, subwoofers, and equipment all be concealed. I designed a stage area that allowed for the speakers to be built into the columns and under the stage. The black mesh coverings of the equipment became part of the design. We looked for ready-made moldings to achieve the elaborate appearance that suited the homeowners and their upstairs décor. To give the look of hand-carved moldings we used two different corbels, or decorative brackets, on each column flanking the screen. The pieces weren’t art deco but they were reminiscent of the grand theatres found at the turn of the 20th century. Double doors were used for the entrance to the theater. We designed special shutters with seals to block out all possible light, so as not to interfere with the viewing of movies. All of the moldings and woodwork were painted metallic gold. The colors that Rosemary chose for the home theatre were sea-foam green and grape, so we had the wall-to-wall carpet dyed the color of grape jelly as a complement. The walls were texturized with Venetian plaster and were painted eggplant, jade, and gold. The wall treatment is very subtle, yet dramatic, creating a shimmering effect when the lights are on. The ceiling was painted black, and accented with many different-sized stars. The new theater was a big hit. After the room was done, the Martirosians saw their grandchildren much more often. Some of the teenage grandchildren actually made sleepover plans with friends at their grandparents’ house. The Martirosians themselves even use it from time to time to watch movies during the week. Anne Hentz of Ann Lee Road is the Designing Diva at annehentzinteriors.com..